Another Christmas season may be in the history books, but if the future is anything like the one technology inventors have postulated about lately, it won't just be Santa seeing you when you're sleeping and knowing when you're awake. Envision a gadget in your living room that can sense when you're squabbling with your spouse or whispering sweet nothings. Imagine a black box that blocks an R-rated show because it notices that a child has entered the room. Dig into public patent applications, you'll see that such scenarios -- as described by the companies that hope to corner the market on the technologies if they ever come to fruition -- are not that far-fetched. We're talking about devices that gather information to help companies deliver ads based on the activities you perform in (what at least for now is still) the privacy of your own home, or charge customers for content based on the number of viewers who are physically present while the entertainment is playing. The thinking behind these futuristic features comes from two major companies -- Verizon (VZ) and Microsoft (MSFT). Perhaps devices based on them will never make it to the market. However, the details revealed in their patent applications provide us with some idea of what the industry thinks is in the future. With that in mind, let's take a look at two surveillance innovations in the works. 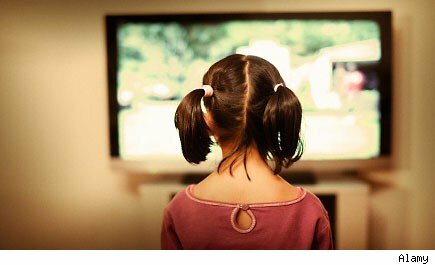 Verizon recently proposed a patent for a set-top box that would allow it to see and hear what you're doing in your living room. According to the patent, the device could obtain a wide range of data, including image, audio, 3-D spatial, and thermal image data, to detect a wide range of activities. Some examples provided in the document include singing, eating, sleeping, cleaning, exercising, fighting, and cuddling. The set-top box would also have the capability to communicate with other devices in the room, such as mobile phones, and send advertisements to those devices based on the information collected. So if you're fighting, the device could send an advertisement for marriage counseling to your mobile device. If you're cuddling, it could send ads for contraceptives or romantic comedies. Verizon claims that this device would provide a number of advantages over other technologies that help target advertisements to the viewer. Other devices form their user profiles based on consumers' direct access with them -- for example, their choices of what programs to watch. Such devices, Verizon says in its patent application, "fail to account for one or more ambient actions of a user while the user is experiencing media content using a media content device. For example, if a user is watching a television program, a traditional targeted advertising system fails to account for what the user is doing." In other words, gathering more information would help Verizon improve its user profiles and help advertisers target their ads more effectively. The Patent and Trademark Office gave a "non-final" rejection in December because the concept is too controversial, but the company now has the option to revise and resubmit the patent. Microsoft also has a patent out for a device designed to collect data about consumers. Specifically, the device is designed to recognize individuals and determine how many people are viewing a program. The technology can be used to purchase viewing licenses based on the number of people watching a program, and to limit the availability of certain programs to particular users based on their age or other factors. Here's where it gets more creepy. A gesture recognizer engine that would gather information to determine who is actually viewing the content and who is simply in the room during the airing of a program. Object recognition technology that would detect and store information about users' skeletal structure. Facial and voice recognition technology would allow the device to identify particular users. Will These Devices End Up in Our Living Rooms? There are a wide range of factors that will determine whether or not companies decide to pursue these technologies and bring them to the market, not the least of which is consumers' willingness to allow such observant machines in their homes. But over time, society seems to be becoming less and less concerned about some forms of privacy, users may be willing to sacrifice a bit more of it in exchange for discounted goods and services, paving the way for such devices as these to move from the files of the patent office to reality. Motley Fool contributor M. Joy Hayes, Ph.D., is the Principal at ethics consulting firm Courageous Ethics. She owns shares of Microsoft. Follow @JoyofEthics on Twitter. The Motley Fool owns shares of Microsoft.